For the past five years, Mardis Forest Products owner and devout Christian Larry Gould feels like he has endured trials to rival biblical Job. Like Job who was rewarded for his unwavering faith, so Gould feels that he has been rewarded with the achievement of his lifelong dream. Gould has established a successful custom sawmill as well as an attached dunnage, kiln strip and lath plant near Canal Flats, B.C., even as dozens of sawmills in the surrounding area have closed their doors. The company has 14 employees. Purchase of the Wood-Mizer LT70 bandsaw was a dream come true for Mardis Forest Products owner Larry Gould (photo below). It has allowed him to manufacture building packages to serve the local active home construction market. The centrepiece of Gould’s personal achievement is the recent purchase of an electric Wood-Mizer LT70 bandsaw with a three strand infeed deck and jump rolls on the outfeed deck to convey lumber to a Coutts edger. With its 15 hp motor, it is designed for precision and not necessarily for speed. 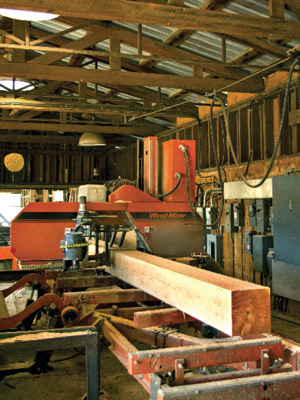 The bandsaw and edger are the backbone of Gould’s custom sawmilling business. Good timing in investing in equipment has also served Gould well. His philosophy obviously has a lot of merit, because today his sawmill and dunnage plant are paid for. Akhurst Machinery was invaluable for gathering all the components needed for his dunnage plant. Gould had a clear vision of what his business should look like and now it is a reality. He is also positioning it for the future by including his son, Jonathan, in all aspects of day-to-day business. All told, the operation consumes between 100,000 to 150,000 cubic metres annually. However, it wouldn’t have succeeded without strong local support. 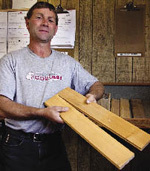 His main dunnage client has been Tembec (now Canfor) which operates large dimension lumber sawmills in nearby Canal Flats and Elko. Canfor purchased the mills from Tembec earlier this year. Gould is highly appreciative of the support and confidence they have shown in him. 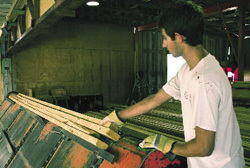 Canfor supplies him with kiln-dried fall down material and he produces their kiln sticks, dunnage and lath. Because the lumber is already dried, Mardis Forest Products doesn’t have to worry about heat treating it, which is an export requirement. The wood provided by Canfor is fall down lodgepole pine, spruce, fir and larch that was destined for the sawmill chipper. “We offered to take product that has a cost attached to it, because it costs the same amount of money to produce 1000 feet of MSR lodgepole pine lumber as it does to produce 1000 feet of reject lumber that gets winged into the chipper,” says Gould. “But it had an extra cost attached to it because it took extra labor to put it into the chipper.” It also produced poor quality chips. Mardis Forest Products uses fall down material from Canfor to manufacture dunnage, kiln sticks, and lath for their Canal Flats and Elko, B.C. sawmills. 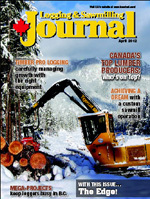 The dunnage plant represents between 60 and 75 per cent of Mardis Forest Products’ income, while custom sawmilling fills out the rest of the balance sheet. Gould purchases cedar, larch and oversize wood that the Canfor sawmill can’t process to manufacture primarily interior decorative products, flooring and decking—products that are in high demand among the many individuals who are migrating to the area and building homes along the corridor from Golden to Cranbrook, attracted by its scenery, hunting, fishing as well as the large selection of ski resorts. The Rocky Mountains flank the valley to the east and the Purcell Mountains to the west. “We will do what other businesses don’t do anymore because they don’t have time for it, or it’s not cost effective,” says Gould. “We will specifically target a certain size of larch and we can saw it in sizes all the way from a 12 inch top to three feet in diameter.” Mardis Forest Products continually breaks down the wood to as small as 1” x 3” to minimize waste. One larch product they manufacture is 1”x 8” flooring that was popular locally back from the turn of the century until the 1950s. The sawmill also uses Douglas fir in its timber frame packages and has supplied such projects as the Kimberley Aquatic Centre. They supply custom packages to several timber frame home developers as well as individual homeowners. Following in his father’s footsteps, Jonathan Gould, takes a turn at the Wood-Mizer LT70 bandsaw, and has become a skilled operator using the sawmill’s Accuset 2 computer setworks. In addition to custom timber frame packages, they also saw produce custom products for the Canfor sawmills, often breaking down their oversize wood to manufacture products used in-house, such as bridge and deck timbers and pile bottoms for their decked wood. Canfor is currently involved in a number of bridge restoration projects for many of its forestry roads. This makes good use of logs with larger knots, while logs that will produce clear lumber are set aside for appearance products. Gould does most of the log sorting himself, since he is the sawmill’s loader operator. Gould says they invested in a top of the line Wood-Mizer LT70 with all the bells and whistles. It includes the Accuset 2 computer setworks, which Gould says has worked well within their expectations. The bandsaw is capable of producing a variety of products from timbers to lumber, and has operated relatively trouble-free after 2500 hours in use. The Coutts edger breaks down the timbers produced by the Wood-Mizer to 4”, 6” or 8” thick dimensions. The lumber is either air dried or sent out for custom kiln drying. Mardis Forest Products is in the process of installing the infrastructure to support a Czech-made TOS Varnsdorf six-head moulder that the company uses to manufacture its flooring and cedar decking. To maximize wood recovery, they also have a resaw supplied by Akhurst Machinery that can be used to remanufacture lumber into higher value added material or to complete a building package. In addition to building components, they can also produce fence packages. “I’ve watched the mills that have been successful to see how they’ve done it and tried to fine tune what they’ve done,” says Gould. “I feel that you have to watch the winners in life to see what they have done to be successful, as well as having contact with the right people in the right places.” There’s no substitute for experience, he adds, because it has provided him with a strong network of supporters, which can be invaluable to a sawmill’s survival, considering the hills and valleys of the industry. This includes several jobs he has taken and contacts he has made over the years working in larger dimension sawmills. Their original dunnage plant was highly labor intensive, with lumber cut to length for kiln sticks using a manual chop saw and then broken down to kiln stick dimensions on a multi-rip resaw. Over time, however, Gould invested in a number of conveyors to create a much more efficient plant. In 2006, an entirely new plant was designed and assembled from equipment acquired from various larger mills and from auctions. By working with Akhurst Machinery, they were able to purchase three pneumatic chopsaws and a new Leadermac ripsaw with a sound enclosure, and numerous conveyor belts. “I think in an industry like this, you have to be somewhat of a visionary,” says Gould. “If you don’t have a vision, you are going to be lost. It’s like a ship without a rudder.” Fortunately for Gould, he was able to hire an experienced millwright who was able to translate his vision into a working dunnage plant, marrying up all the acquired equipment into an efficient operation through the use of various live decks, conveyors, unscramblers, infeed decks, all under one roof. The plant requires one more building phase, which will include a more automated system as material is still piled manually at the outfeed. Gould has already acquired the equipment. It is just a matter of the economy improving to justify the installation. A plan is also in place to enclose the entire operation to create a more comfortable work environment for employees and to protect equipment.